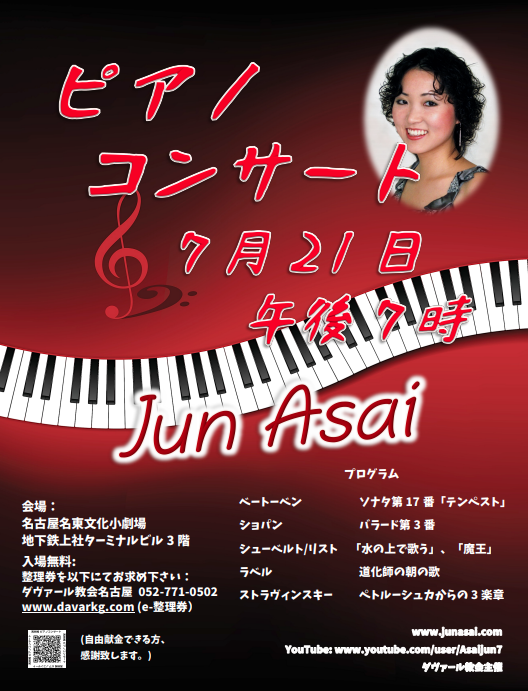 New video added from the recording of Jun Asai Piano Recital. 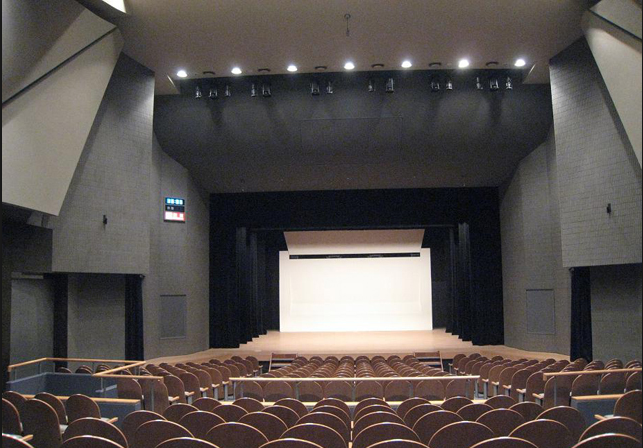 Free Entrance but seats are limited. 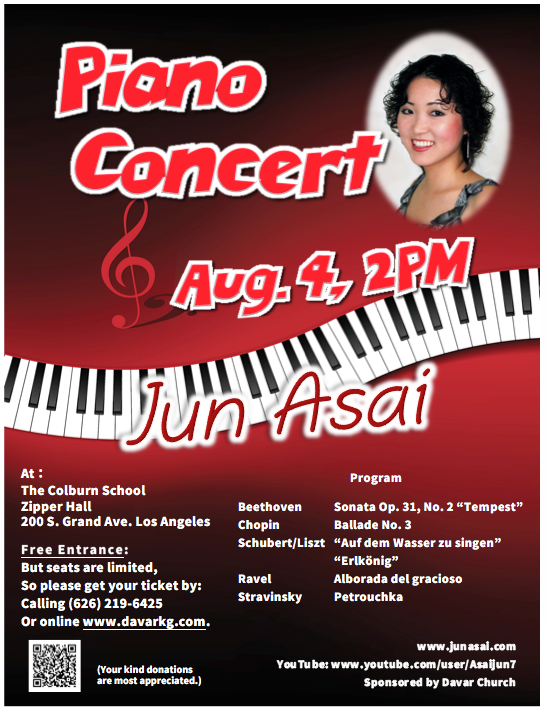 A laureate at many international competitions, Colburn alumna and pianist Jun Asai returns for her annual concert at Zipper Hall in a recital highlighting program music. Beginning with Beethoven’s op. 31 no. 2, allegedly inspired by Shakespeare’s play “The Tempest,” we enter the world of magic and illusion under the spell of Prospero the sorcerer. Chopin’s Ballade No. 3 has no such explicit program, but the title itself evokes the literary form in which a narrative was often set to music. The first Lied by Schubert conjures up the movement of waves at sunset as the poet muses on the passage of time. The second Lied tells the story of a boy and his father (and an unwelcome guest) riding through the forest at night, with one of the most bone-chilling endings in literature. Alborada is a morning serenade sung to wake lovers but, in this case, sung by…a buffoon (with a guitar). We return once more to the world of magic in Petrouchka, the classic tale of a puppet brought to life, only to be caught in a love triangle and violently murdered. But is he truly dead? Only you can tell. This recital is sponsored by Davar Church, where she currently serves as Music Director. 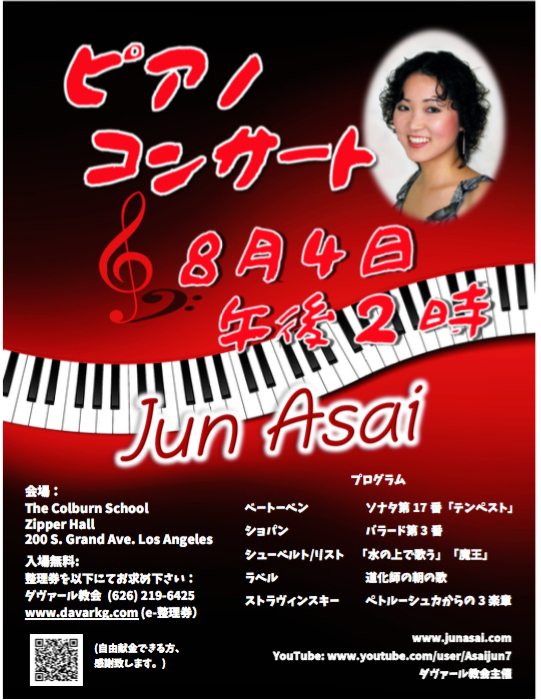 Jun Asai has performed with the L.A. Philharmonic, Glendale Philharmonic, Fort Worth Symphony, Utah Symphony, Nagoya Philharmonic and Shanghai Philharmonic. 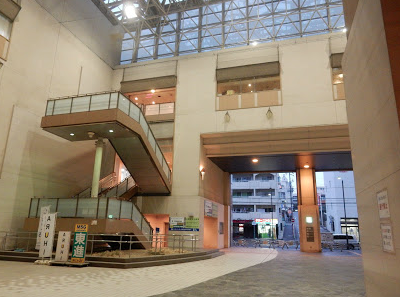 Winners of various prizes, including at L.A. Phil’s Kaper Awards, the National Chopin Competition, Shanghai Int’l Competition, Joanna Hodges Int’l Competition, Bachauer Int’l Competition, New Orleans Int’l Competition, Città di Cantù Int’l Piano Competition, etc. Her teachers include Eduardo Delgado, Daniel Pollack, Oxana Yablonskaya, and Yoheved Kaplinsky. She has also worked with John O’Conor, Arie Vardi, Mikhail Voskressensky and Nelita True in various masterclasses. She gave her debut recital at Carnegie’s Weill Hall in 2002, appeared four times on the TV program “Musical Encounter,” and played the role of a piano prodigy in “Sneakers” with Robert Redford. She was born in Tulsa, Oklahoma, and grew up locally in Pasadena where she took lessons at the Pasadena Conservatory of Music and later at the Colburn School of Music. She entered the Juilliard School at the age of 15, graduated with a Master’s Degree in 2004 and is currently in the doctoral program at the Johns Hopkins University under the tutelage of Leon Fleisher. She serves as music director at Davar Church in Pasadena. to the school is located at 200 South Grand Avenue between Second and Third Streets.